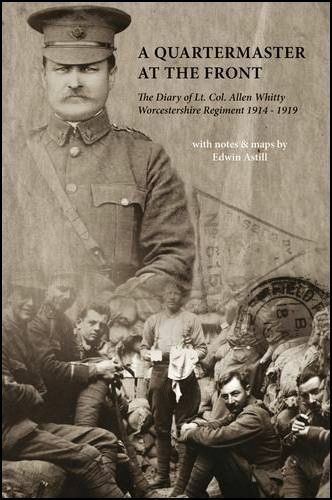 Allen Whitty had a long and distinguished career with the 3rd Battalion Worcestershire Regiment from 1884 until 1921. His diary covers his time on active service on the western front from the beginning of the war right up until the post-Armistice occupation. The diary is presented as it was written, interspersed with brief notes about the battalion’s movements in the context of the overall campaign. Of particular note are the sections on the retreat from Mons (the confusion of the troops is evident) and the anticipation of the German March offensive in 1918. The diary entries themselves are very factual and to the point, ranging from one line to short paragraphs when the battalion are involved in major battles. Whitty’s personal opinions rarely shine through although there are exceptions to this, particularly when he writes about men who were ‘shot at dawn’. As the battalion Quartermaster Whitty’s experiences are different to those of many other diarists, as although frequently in the frontline he was not engaged in the fighting. However the diary provides a valuable insight into the work of the Quartermaster and particularly the trials faced in organising food and supplies for the frontline troops, especially early on in the war. The perils of shellfire and the disruption it can cause to the supply chain are the subject of many entries, and Whitty himself had a few narrow escapes. During the course of his diary Whitty refers to many individuals in the battalion (usually officer casualties or changes in command); endnotes provide handy additional information about them. The book is modestly illustrated with a few pictures of Whitty as well as the 3rd Worcestershire Battalion in the frontline. There are also a few small maps although greater detail on these would have been beneficial. The battalion war diary could also have been better utilised to complement the diary entries. Whilst Whitty’s diary may lack some of the experience of combat that many readers seek in books of this genre, it provides a useful introduction to one of the lesser documented aspects of the war and for that must be commended.